Get Ready to Immerse and Emerge! Ryan DeLuca and Preston Lewis, BodyBuilding.com founders, are breaking new ground again. Big time! They have imagined and are building a new generation of fitness gyms – Black Box-VR. www.blackbox-vr.com. This boutique gym will take fitness and virtual reality to new heights. For their flagship store on Market Street in San Francisco, Black Box chose CSHQA to design the tenant improvement from a bare walls space into a sophisticated gym experience. The project includes experiential VR workout rooms, warm up space, restrooms and showers, branded retail space, sophisticated lighting and sound systems, and selfie spaces with hero images. 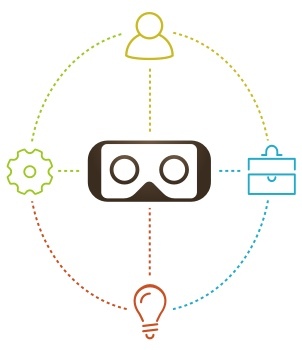 CSHQA’s involvement in the Idaho Virtual Reality Council led to the connection. Black Box was looking for a design team to provide a high level of design, incorporate intricate lighting and graphics, and deliver in a short time. With both companies located in Boise and both committed to using VR applications and tools in their businesses, a strong partnership was quickly formed. It also helped that CSHQA was willing to meet a very aggressive schedule, just 6 weeks from talking to construction documents! What is a Daily Journey? How do you start your day? Out of bed, shower, closet, kitchen…? We typically follow a pattern or variations of a pattern. It’s familiar and easy to repeat. This idea extends out of the home into other spaces, including workout gyms. Ryan and Preston want clients to experience the same ease of use when they come to Black Box. An interactive and experiential ‘daily journey’ is essential to attract and retain members. CSHQA’s design considered space volumes, adjacencies, access, wayfinding, materials and décor. Through VR both owner and design team were able to experience the full space as if it were already constructed. As design progressed, the daily VR journey from entry to check-in to lockers to workout space evolved and was refined. Given a set number of work out rooms, it was important to provide amenities that felt spacious without utilizing large amounts of square footage. Every nook and cranny was explored within the VR model to make the maximum use of space. In addition to the journey, the design creates stages of intensity relating to the users’ experience and level of focus. Users arrive and depart from a social and communal area with warm, natural accents and lighting designed with inviting colors. The progression to more intense areas includes darker tones and bright accents, prompting the user to focus on their workout. And to an additional layer of unique lighting is applied to give the user a once in a lifetime, month, or daily experience. VR allowed the designers and Black Box to validate each of these experiences. CSHQA also understands the need to attract passersby. The VR model allowed the team to view into the windows from outside the building at different times. Nighttime lighting is especially important, as are intriguing sightlines into the daylit spaces. Over five weeks of design the model progressed from white-box spaces to fully developed rooms and hallways, finishes, lighting, materials, and décor. Seeing the model fully rendered enabled the client to walk about the space and trace their journey. Between client meetings the architecture and engineering teams met to discuss details of layout, mechanical and electrical systems, lighting and fixtures. This enabled them to discover any conflicts or misses before beginning final documents. Through the design period the Black Box team reviewed the VR model weekly. Each iteration moved the project forward and construction documents were quickly completed. The project is now in the permitting process with a goal of completion by October 2018. Rory Heggie, Architect and Jim Marsh, Senior Architect, with support from Evelyn Peterson, Revit and VR Facilitator, led planning and design.